Have you played many Minecraft games? Have you been a newcomer to Minecraft world? Whether you are a newcomer or a big fan of Minecraft game or not, what about participating in The Minecraft Quiz 2? The game will help players either review their knowledge of Minecraft or get some basic information before officially playing a Minecraft game. Compared with the first one, The Minecraft Quiz 2 has less checking points and more calculations involved. Some questions sound easy such as what the name of the Minecraft character is, but some ask about details such as how much EXP is needed for level number 50. If you sometimes feel uneasy to answer a certain question, hints will help you. 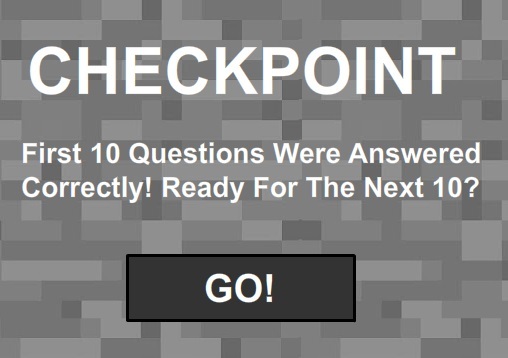 A checking point appears after 10 questions, and one wrong answer will take you back to the nearest checking point. A large number of players have agreed that The Minecraft Quiz 2 is an interesting game, so we are waiting for your comments. Let see how many questions you can answer for the first time! By the way, having a friend to play with you seems to be more exciting than playing alone. + The mouse is used to play The Minecraft Quiz 2.